The release of A Genealogy of the Verse Novel late last year brings a welcome addition to verse novel research. Catherine Addison, an academic in the Department of English in the Faculty of Arts at the University of Zululand, South Africa, has already published several articles on this area of research in recent years, and here brings to the table a significant scholarly contribution. Chapter two has a focus on ‘Early Verse Novels’. Addison takes as her starting point William Chamberlayne’s Pharonnida, a seventeenth-century poetic narrative she believes could well be the ‘first attempt at a verse novel in English’ (2) before discussing works of the eighteenth and nineteenth centuries including Christopher Anstey’s The New Bath Guide, Tobias Smollett’s The Expedition of Humphry Clinker, Anna Seward’s Louisa, Byron’s verse novella Beppo and his Don Juan, George Crabbe’s Tales, Alexander Pushkin’s Eugene Onegin and Adam Mickiewicz’s Pan Tadeusz. In Chapter three, Addison analyses eighteen ‘Early Victorian’ verse novels published between 1848 and 1895 in Great Britain and the United States of America. Addison first considers works that utilise iambic pentameter – beginning with blank verse (Aurora Leigh; Denzil Place; The Ring and the Book; Pygmalion and others) then proceeds to heroic couplets and stanzas based on five-beat lines (Griselda; Laurence Bloomfield in Ireland) – before turning her critique to verse novels composed in sonnets (Modern Love), hexameter verse (The Bothie; Amours de Voyage) and tetrameter verse (The Angel in the House; The Victories of Love; Clarel; Lucile; Geraldine; Anderleigh Hall; Jason of the Golden Fleece). While the period’s verse form variations are known to scholars, Addison contributes insightful commentary about the particularity of the effects arising from the poetic and narrative features of each text, and this is not the only chapter where she does so – indeed it is a strength of the book overall. In Chapter four, ‘The Earlier Twentieth Century’, Addison discusses verse novels in free-verse form followed by examples that utilise jazz rhythms, blank verse, mixed-form, and lastly, works with consistent stanzaic form such as ottava rima. Perhaps unsurprisingly many of the verse novels in this period are preoccupied with either the Great War or the Second World War. It is constructive that Addison eschews a tick-the-box approach to genre inclusion. For instance, although she eventually concludes that David Jones’s In Parenthesis is not a verse novel, but rather ‘should merit a different term altogether’ (257), she finds it invaluable to discuss ‘because it comprises both verse and novelistic elements and also because its resistance to classification is revelatory, illuminating a fairly widespread approach to genre in the avant-garde literature of this period’ (246). The chapter begins with a defence of Edgar Lee Masters’s The Spoon River Anthology – as a proto-verse novel. Addison takes an unhurried nine pages to evaluate its lyric and narrative aspects, before commenting on its cumulative narrative effect. Later in the chapter she also discusses Masters’s Domesday Book. Addison devotes a further eight pages of analysis to Gilbert Frankau’s trilogy of verse novels written in ottava rima. Other verse novels of this period include Eileen Hewitt’s Donna Juana which as the title suggests, takes its impetus from Byron’s Don Juan, and verse novels by each of the Benét brothers: Stephen Vincent Benét’s John Brown’s Body and William Rose Benét’s Rip Tide. Addison takes some liberty in extending ‘The Earlier Twentieth Century’ to the 1960s, though this ensures the inclusion of the Valediction series, the predominantly-verse narratives by the British writer Philip Toynbee – Pantaloon, Two Brothers, A Learned City and Views from a Lake – as well as Christopher La Farge’s three verse novels. In a final Chapter five, ‘The Contemporary Age’, Addison analyses a selection of verse novels written in free verse, short-line and short-to longer-line free verse, long-line free verse novels, metrical verse, unrhymed forms, including blank verse, terza rima and related forms, ottava rima (and some Spenserian stanzas), sonnets, four-beat lines, the Onegin stanza and related forms, and mixed-form verse novels. Addison ends by discussing new forms, exemplified by Brad Leithauser’s Darlington’s Fall. It is fitting that all the verse novels analysed – including those by Australian verse novelists Les Murray, Dorothy Porter, Paul Hetherington, Alan Wearne and Matt Rubinstein – are contextualised according to form, rather than country of origin. While Addison suggests this approach is not without difficulties, A Genealogy of the Verse Novel – for all its formalist preoccupation – comprehends the verse novel in an ever-expansive global stage. Although Addison only analyses verse novels from Anglophone countries or in English-language translations, she nevertheless is mindful of the verse novel’s cultural and geographical diversity, and cites recent contributions emanating from Israel, Algeria, Uganda, Canada and South Africa. Adam Mickiewicz’s Pan Tadeusz, published in Poland in 1834, and Nazim Hikmet’s Landscapes from My Country, published in Turkey in 1963, are also welcome inclusions. Addison’s analyses draw attention to the unique interactions of poetic and narrative strategies in each verse novel. This is not a serendipitous outcome; Addison foregrounds it in her intentions: ‘In characterizing a specific text as a verse novel, both features need to be anatomised, especially at their intersection’ (8). The hybridity of the verse novel, Addison contends, justifies this approach – and its underlying assumption that form has implications for meaning (8). In my opinion – admittedly as an outspoken proponent of poetic and narratological analyses of verse novels – Addison’s simultaneously rigorous and flexible analyses substantiate the efficacy of her approach. 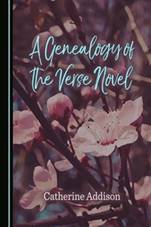 A Genealogy of the Verse Novel is well-conceived and thorough in its tracing of verse novel lineage. Its subsequent exposure of the misogyny within a particular subset of verse novels is exemplary. It presents in some detail, analyses of verse novels by more than sixty authors, and the resultant discussion is lively, enabling an engaging read. If there are certain limitations in Addison’s methodology, such as her ‘rough estimate’ (361) of line lengths – given the texts’ diversity, there seems no alternate means of classification. Perhaps other worthy verse novels might have been included – but not without the book exceeding five hundred pages. Certainly, by the end of the book, the reader has no doubt as to the complexity of verse novels. A Genealogy of the Verse Novel is thus likely to have a considerable impact on how the form is valued, interpreted and critiqued. Linda Weste won the 2016 Wesley Michel Wright Poetry Prize for excerpts from her verse novel set in roman antiquity, Nothing Sacred. Her PhD on verse novel poetics was completed at the University of Melbourne. Her articles can be accessed at http://unimelb.academia.edu/LindaWeste.